By buying this product you'll earn up to 92 Rewards points. 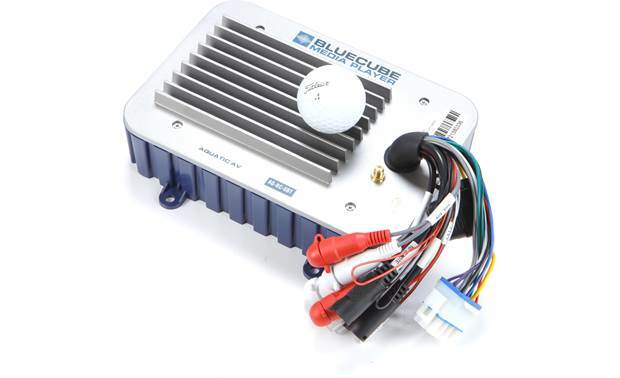 Pack a lot of power and versatility into an out-of-sight small package with Aquatic AV's AQ-BC-6BT-G Bluecube spa stereo. Designed to be stealthy and waterproof, this stereo still puts out lots of power for your speakers, even 2-ohm models. Built-in Bluetooth lets you play your favorite music directly from smartphones and other mobile devices. Whether you're hanging out by the pool or chillin' in the hot tub, that's a huge benefit. This stereo's built-in Bluetooth enables you to pair two phones, so you can stream your favorite music. You'll also get basic track and volume controls, so your phone doubles as a remote. Now if you want to keep your phone dry and would dig more options, you can add the Aquatic AV AQ-RF-6UBT 2-way wireless remote control. This waterproof remote lets you choose your source, access different tracks, try out some EQ settings and tone controls to shape up your music, and use the stereo's 12-volt triggers to turn on accessories such as lighting. The AQ-BC-6BT-G has plenty of power for four speakers, but can push up to eight if you really want to treat yourself. The set of RCA outputs lets you add an amp or powered subwoofer for more oomph to round out your sound. 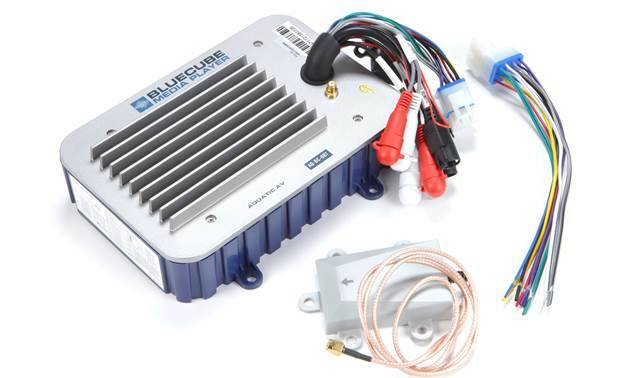 Overview: The Aquatic AV Bluecube hide-away media player allows you to power speakers for your spa, hot tub, or pool area with it's built-in 288 watt amplifier. It allows you to stream music from your Bluetooth enabled smartphone or tablet and also includes a pair of RCA wired inputs for connecting a portable music device from its headphone or audio output jack. The optional AQ-RF-6UBT wireless remote control (sold separately) gives you additional features such as Virtual Bass, DSP EQ, Bass/Treble, Balance/Fade, control of the 2 external 12 VDC Trigger outputs, selection of the Auxiliary input, as well as control of your Bluetooth audio streaming. 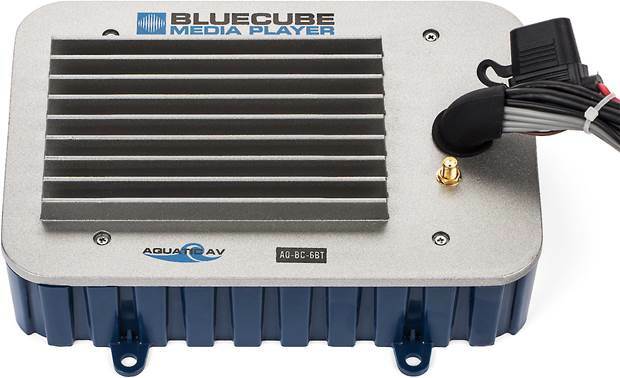 Bluetooth: The Aquatic AV Bluecube lets you stream audio from your Bluetooth enabled smartphone or tablet. 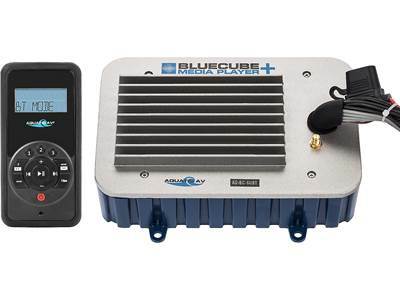 Up to 2 devices can be paired to the Bluecube with one playing at a time. While streaming from one device, simply start playing the other paired device and after 10 seconds the Bluecube will switch to the second device. 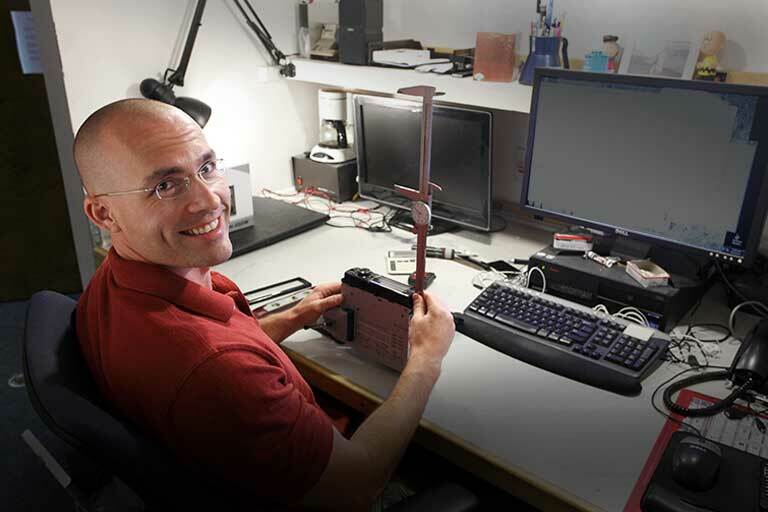 Devices can be switched back and forth as many times as desired. When using the optional AQ-RF-6UBT remote, basic playback controls, such as Play/Pause, Forward/Rewind, are available in lieu of controlling your Bluetooth device directly. Halo Aerial Technology: A Halo Aerial Technology Bluetooth antenna is provided for increased wireless signal strength and range over standard Bluetooth signals. This 3" x 2" module with a 37" cord plugs into the antenna jack on the media player and gets mounted up high with the arrow indicator facing the sky for best reception. Female 12-Pin Watertight Harness: Plugs into the included 12-pin male harness for power, ground, remote out, and speaker wires. RCA Auxiliary Inputs: Allows playback from a portable media or home CD player (Only selectable when using the optional AQ-RF-6UBT wireless remote control). 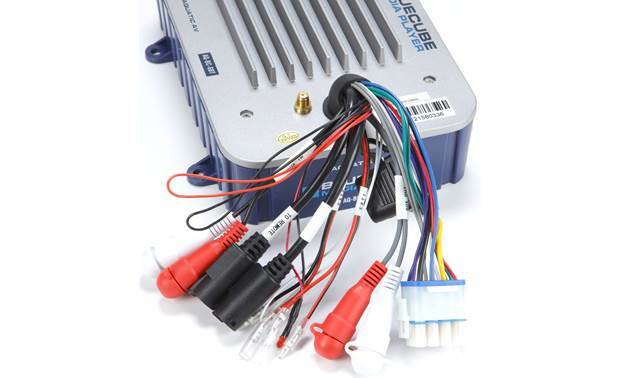 RCA Outputs: A second set of RCAs is provided for outputting the sound to an additional outboard amplifier or powered speaker (both sold separately). (2) 8-Pin DIN Connectors: Used for connecting optional wired and wireless remote controls (both sold separately). 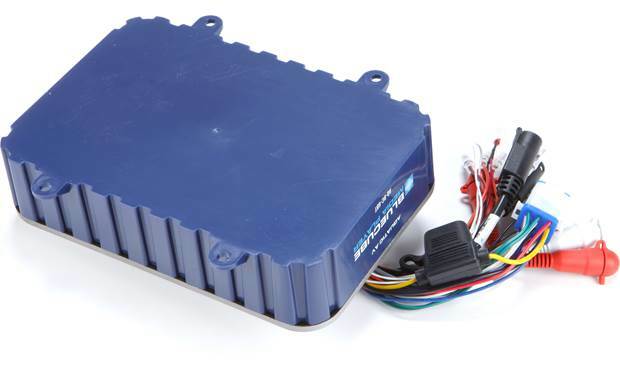 (2) 12VDC Trigger Outputs: Allows triggering of external lighting or relays (Control is via optional AQ-RF-6UBT wireless remote control, 3A max load). Power Attenuation Wires: Two looped wires can be cut to increase or decrease the output level. Options are -6dB, -3dB (default), 0dB, and +6dB. Power LED: A red power LED indicates when unit is powered on. 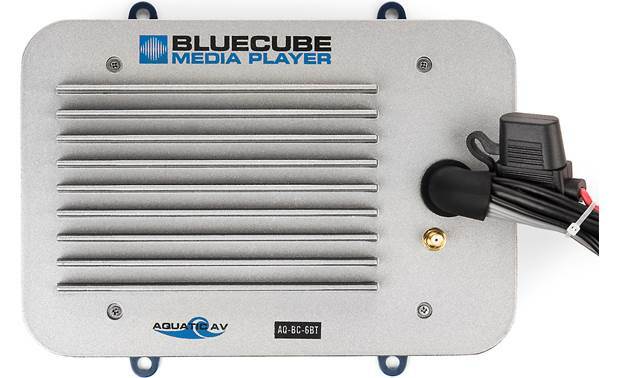 Dimensions: Width - 8.0", Height - 3.0" (including wiring), Depth - 6.50"
Searches related to the Aquatic AV AQ-BC-6BT-G Bluecube hideaway spa stereo.